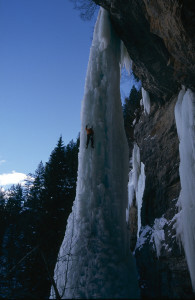 A journey around the world of Ice climbing in the hands of Joan Quintana i Paredes, probably one of the most well-known ice climbers in Spain. 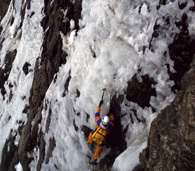 Since the end of the seventies to the present, more than 30 years of ice climbing. 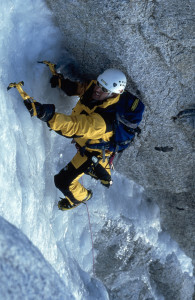 We will learn about the evolution of one of the lesser known specialties in mountain climbing, its evolution, the key figures and we will visit the classic ascents of the Alps, and even some of the most beautiful and difficult ice waterfalls in the world. 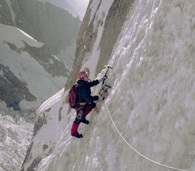 For more than 20 years, Joan Quintana i Paredes dedicated a good part of his life to climbing some of the most classic and difficult ascents on the Italian face of Mont Blanc. 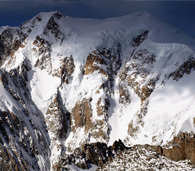 You will find out about the classics such as Brenva Spur, the Major, Red Sentinel, as well as the legendary Poire route on the Brenva slope, two ascents on the North face of the Grand Pilier d’Angle, the Peuterey Ridge, the Central Pillar of Frêney and the far off Mont Brouillard. 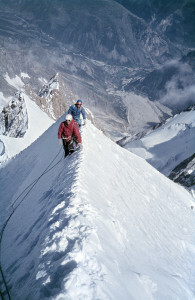 Mountain climbing of the highest extreme, quality and quantity on one of the most precipitous slopes of the Alps. 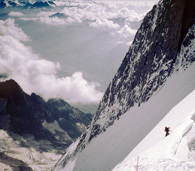 The distance from Courmayeur to the peak of Mont Blanc is the same as that from the base camp on Mount Everest to the peak. 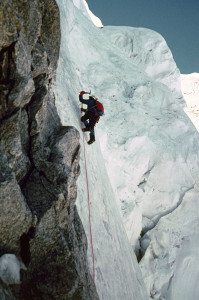 Video of a solo ascent of the “Banzayous IV-4+” in Gavarnie. Joan Quintana i Paredes, is probably one of the most knowledgeable people on Gavarnie, its history and evolution. 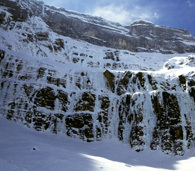 Since the beginning of the eighties, he has dedicated a part of his winters to climbing almost all of the ice waterfalls of the Cirque. 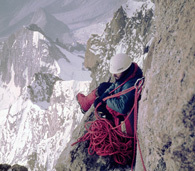 10 first new ascents. 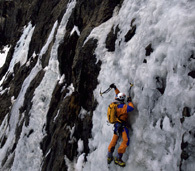 He finished each winter with an “In Solo” ascent of one of its waterfalls. 7 in total.